Tiger Woods is still the main attraction at the U.S. Open. SOUTHAMPTON, N.Y. — Just before 10 a.m., thousands of spectators moved up the hill on No. 9, like pilgrims on their way to their holy land. In a way, they were. Tiger was on the ninth green, putting. At 10:31, five golfers bent over their work on the practice green. Jason Day and Henrik Stenson, both major champions, were among them. Three dozen people watched. At 10:32, Tiger exited the locker room and joined them. By 10:37, the crowd had swelled to more than 400, five or six people deep behind the green retaining rope. Arms raised, phones turned sideways, they clicked away. They weren't taking pictures of Tommy Fleetwood. It was Tuesday, and Tuesday at the U.S. Open is Tiger day. Of course, when Tiger plays in a major, every day is Tiger day, especially since he missed them all in 2016 and 2017. "Everyone realizes it's different when he turns up," Day said. "He definitely moves the needle when it comes to ticket sellers, more fans, more media, more players on the putting green." Tiger parked his $20 million luxury yacht in Sag Harbor last week like some classic Bond villain rolling into town. He's staying there partly to beat the crippling Long Island traffic around Shinnecock Hills Golf Club, which reached record congestion Tuesday morning — 2 1/2 hours at 5:30 a.m. to go 40 miles eastbound. Tiger practices with the roosters, and early birds were flocking to see his first scheduled appearance at a U.S. Open since 2015. He also brought the yacht because he's still Tiger Woods, the biggest baller in the business. By contrast, Day and Bubba Watson, who have combined for three major wins and have earned more than $40 million apiece as professionals, are living out of customized buses this week. They're not exactly Cousin Eddie's RV, but neither are they a 155-foot "dinghy," as Woods jokingly called his floating palace, unsubtly named "Privacy." Woods emitted an energy that completely enveloped the Hamptons as soon as he dropped anchor. It isn't the same sort of energy he used to give off from 1997 to the middle of 2008, when he won 14 of 46 majors, three of them U.S. Opens, one of those 56 miles west of here at Bethpage Black. But Tiger remains a powerful force, even if his opponents no longer fear him and his fans no longer consider him invincible. Not after four back surgeries, which, he said, make him grateful for the chance to play this U.S. Open after he missed the last two. This time last year he'd just gotten off the couch. "I was just given the OK to start walking again, start moving around, and this was, what, June," said Woods, who couldn't even play with his children. "It was about just having my standard of life. Forget golf. Can I actually participate in my kids' lives again?" He can do more than that. 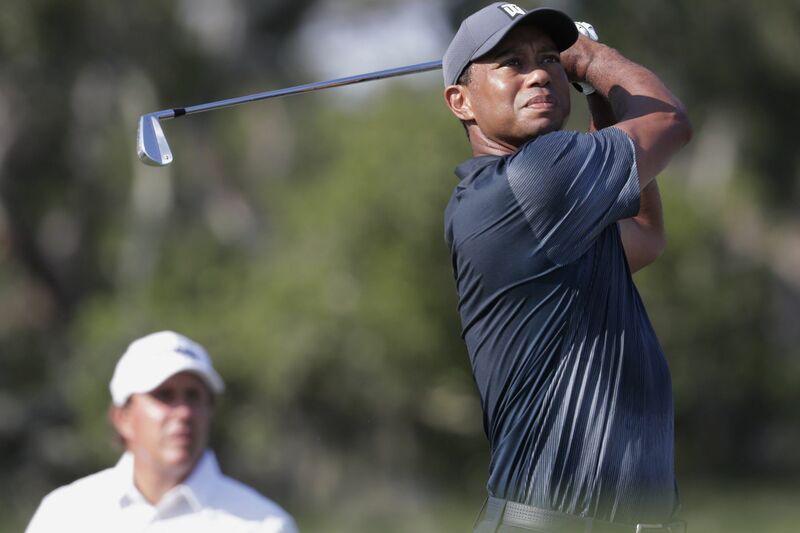 Since the beginning of the year, he vaulted up 588 spots in the world rankings, made eight of nine cuts and finished in the top-25 six times, with a tie for second at the Valspar Championship on March 11 and a tie for fifth the next week at the Arnold Palmer Invitational. He then tied for 32nd at the Masters. "To go from there to where I'm at now, I had no expectation of getting this far," Woods said. "A lot of this is pure bonus because of where I was. … It's just a great feeling, and one that I don't take for granted." Not after scandal, and divorce, and his DUI-on-tape from May 29, 2017. So, yes, things have changed. His aura has dissipated. Still, he moves the needle. Golf fans generally see him as a fading legend battling injuries and demons, pursuing the final four majors that would equal Jack Nicklaus' l8. Golf pros, on the other hand, see him as a faded legend whose magnificent career and magnetism made golf cooler and more lucrative than ever, but whose injuries and demons robbed him of his mojo. For most of the field at the 2018 U.S. Open, Woods, now 42 and a decade removed from his last win at a major, is just Mr. 80 — the guy ranked between Adrian Otaegui at 79 and Julian Suri at 81. That's why not every golfer recognizes the power of Tiger's presence. "During the tournament, you can tell when he holes a putt compared to someone else," said Marc Leishman, who won twice last year and is ranked 14th. "But on practice days, there's no difference at all." "If I'm not playing with him, then I don't feel a difference, whether he's there or not," said Jordan Spieth, who holds three major titles at the age of 24, including the 2015 U.S. Open championship. Can you blame them? Woods has only played in half of Leishman's six U.S. Opens. He only played in half of Spieth's six U.S. Opens, too. Woods' best result in those three came in Spieth's debut, when Spieth was an amateur in 2012. Woods tied for 21st with five other golfers. Spieth was one of them. Spieth was 1 year old when Woods took over the No. 1 spot on June 15, 1995, and though Tiger owned the top spot for 623 of the next 698 weeks, Spieth was only 17 when Tiger relinquished it on Oct. 30, 2010. Tiger reascended for 60 weeks in 2013 and 2014, but Spieth was still deciding between baseball and golf. It certainly isn't necessary for every young golfer to recognize the full relevance of Woods. Most of them never experienced Woods at his best. Unless they're playing with him and dealing with his massive galleries, having 2008 U.S. Open winner Eldrick Tont Woods in the field means little more than having 2009 U.S. Open winner Lucas Hendley Glover. Still, players such as Spieth and Leishman are the exceptions. Francesco Molinari is truer to the rule. Molinari, ranked 18th, strolled up to the putting green at about 10:45. He didn't even bother to bring a putter. His eyes followed Tiger. Day noticed. "I got [to the putting green], and there were only like four or five guys putting. And then Tiger rolls up, and there's 30 guys on the putting green," Day said, laughing. "It was hard to do your work. But that's just the Tiger effect. Everyone wants to see him. Everyone wants to see what he looks like, and how big is he, or just kind of see what, I guess, the myth was behind Tiger Woods. "I was like that when saw Tiger Woods for the first time. I wanted to go on the putting green and putt a round next to him and stare at him." A titter of laughter circulated the putting green. Molinari joined in. Asked if that sort of squealing was normal, Molinari shook his head and smiled. "No, it's not usual," he said. "It's just … Tiger."